Join us for an unforgettable adventure down some of Thailand's best rivers as they tumble out of the tropical mountains of Thailand. We offer visitors several exciting river rafting trips in Thailand. With a view to safety and the most enjoyable experience, our raft trips or raft expeditions are accompanied by experienced raft captains. Our captains are friendly, well trained locals. Their knowledge of the river area, in which they were born, is tremendous. They will be happy to answer any question you may have and share with you their knowledge of nature and traditions in the area you visit. On every river expedition, we use strong hypalon self-bailing rafts and canoes. Adequate equipment such as life jackets and helmets is provided. We use watertight containers, which are always readily accessible, while on the rafts as well as sturdy dry bags to keep particpants' belongings dry. Participants are required to wear a life jacket and helmet whenever on our rafts. During our expeditions all food and drinks will be provided with the exception of alcoholic beverages. Drinking water, tea and coffee are always available. specializes in whitewater rafting kayaking trips in Chiang Mai and Northern Thailand. We operate adventure tours for the culturally minded with an emphasis on preserving local ways of life and customs. We can tailor make your adventure for you, your family, or your whole group - from airport pick up to drop off! With our private river camp and junglehomestay located less than 75kms from Chiang Mai's old city center on the Mae Taeng River in Sop Kai Village. We offer you a genuine jungle experience. Our unique jungle homestay,Hill tribe trekking excursions, elephant treks, whitewater rafting trips,whitewater kayak school canyoning, full moon rafting and multi-sport trips are unbeatable! Come experience a life of adventure with us for one or multiple days and enjoy a break from the tourist crowds of Chiang Mai. The heart beating, gut wrenching thrill of shooting the rapids and getting yourself wet is one adventure that should not be missed. This is especially so when it comes to river rafting in Thailand where the endless drops and falls combined with the beauty of the surroundings makes it ever more pleasurable! Here, one can raft past waterfalls, hot springs, and rapids. River rafting activities in Thailand are concentrated in areas like Mae Nam Pai River, which originates at Thanon Thongchai and Daen Lao mountain ranges, and runs for 180km pass several districts in Mae Hong Son province. Another ideal place for rafting is Mae Nam Wa. Mae Nam Wa is a tributary of the Nan river, originating at Khao Chom Pi Pan Nam mountain range at the Thai-Laos border. 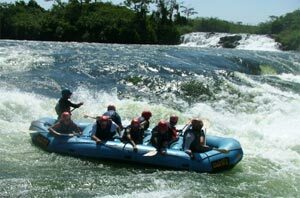 With its many rapids, it is considered ideal for those seeking more fun and thrill. Other suitable rafting locations are found at Mae Klong-Ti Lo Su Waterfall, Mae Klong-Ti Lo Re Waterfall, Mae Nam Sai Yai, Mae Nam Phetchaburi, and the Nakhon Nayok river.